This month, we’re announcing several new Office 365 investments to help people better collaborate. This includes the much anticipated Skype for Business Mac Preview, new Yammer external groups and improvements in our Office Mobile apps on Windows Phone, iOS and Android. Please read on for details. Today, we are excited to announce the start of the Skype for Business Mac Preview. This new app offers a simple yet powerful experience that brings our Mac customers into the modern era of Skype for Business. 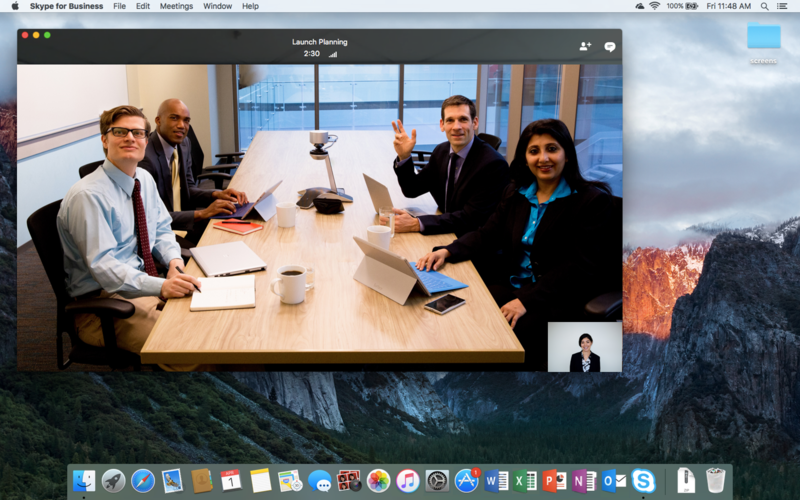 Skype Meetings are now available with the Skype for Business Mac Preview. The Skype for Business Mac Preview will release in three cumulative stages leading to public availability planned for Q3 of 2016. Today’s initial release lets you see and join your meetings. We’ll soon follow up with additional value, including the contact list and conversations via chat, audio and video. Commercial customers can request an invite to test the new Skype for Business Mac Preview at SkypePreview.com. We’ll start by issuing invites to IT professionals and continue rolling out invites on a daily basis with the goal of rapidly increasing usage before opening up the preview to everyone. To learn more about the Mac Preview, read the Skype for Business Mac Preview blog. 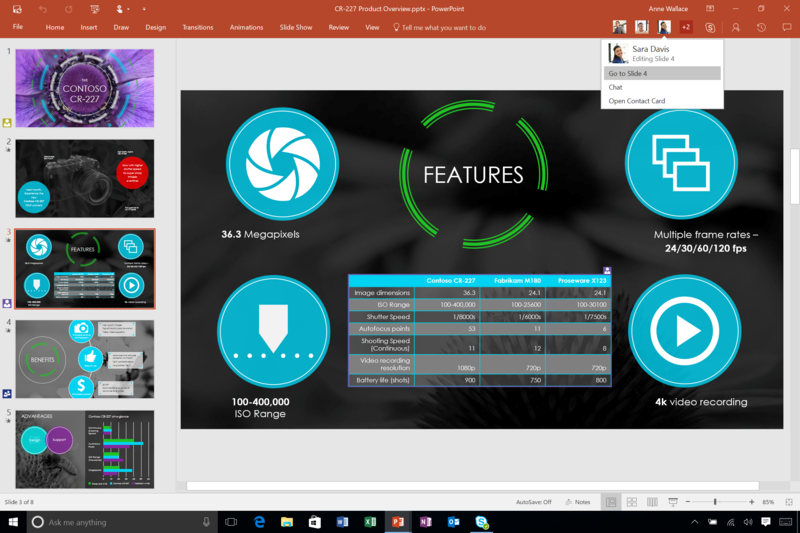 This month’s updates to Office 2016 desktop client bring the collaboration experience front and center. 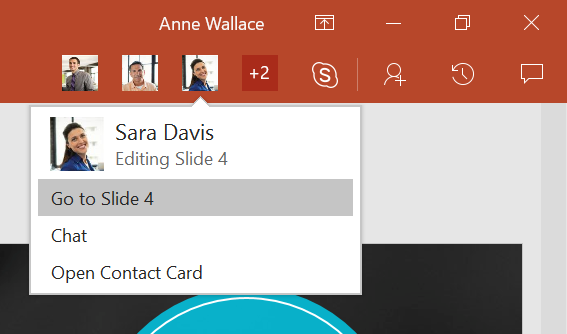 Core sharing capabilities, a new document activity feed, presence information and Skype for Business instant messaging are now all available at a glance in the top right corner of documents that you are sharing with others. Now you can easily see who’s working and where in your documents, as well as quickly start real-time conversations with Skype for Business. 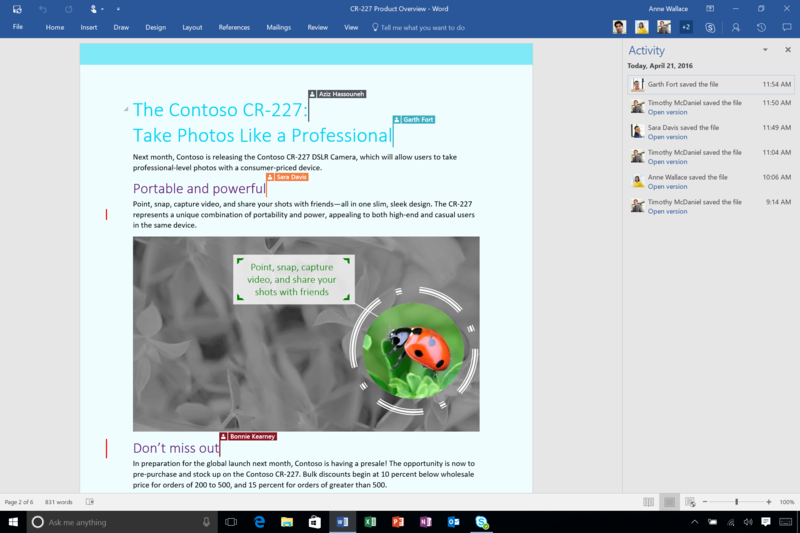 People hub—Now you have more visibility into who is actively working in a Word or PowerPoint doc with you. At a glance you can quickly see everyone participating in the document on the ribbon and then, with one click, jump to exactly where they are working. Skype for Business integration—You can click a person’s thumbnail to initiate a Skype for Business IM conversation or see their full contact card. Click the Skype for Business logo to initiate a group chat with everybody currently working in the document. Activity feed—Quick access to the activity feed makes it easy to see what’s been happening in your document, presentation or spreadsheet saved in SharePoint or OneDrive for Business. The Activity feed shows you a full history of changes, and you can easily open or even revert to a prior version if you need to. Comments—With one click you can make or view comments in your document or slide. Collaboration flows easily with threaded conversations and quick access buttons that let you reply to or resolve comments, and then mark items as complete. 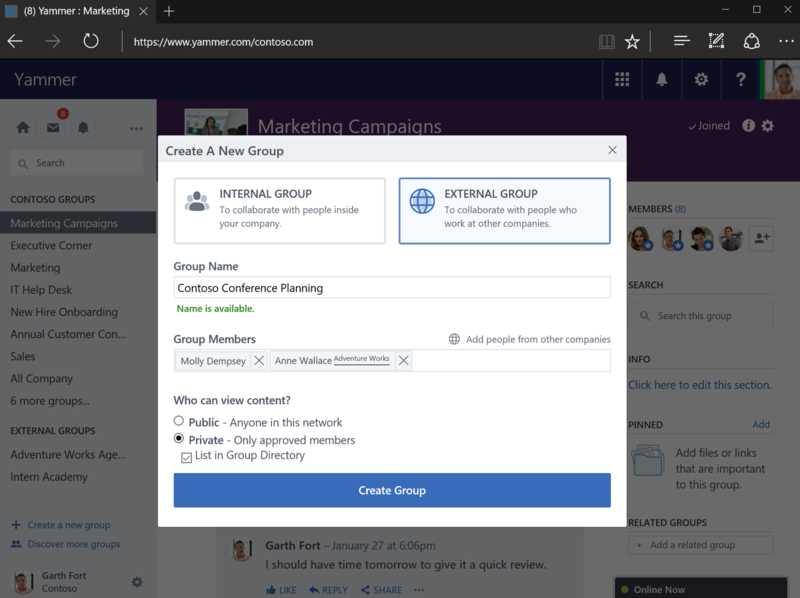 Office 365 customers can now create external Yammer groups for seamless and secure collaboration across company and organizational boundaries. External groups work just like internal groups by enabling conversations around topics, documents, notes and links that can now extend to customers, partners or people in other organizations. We have put controls in place to ensure the security of information, such as requiring group admin approval before external members are added and allowing Office 365 admins to disable external groups for the organization. 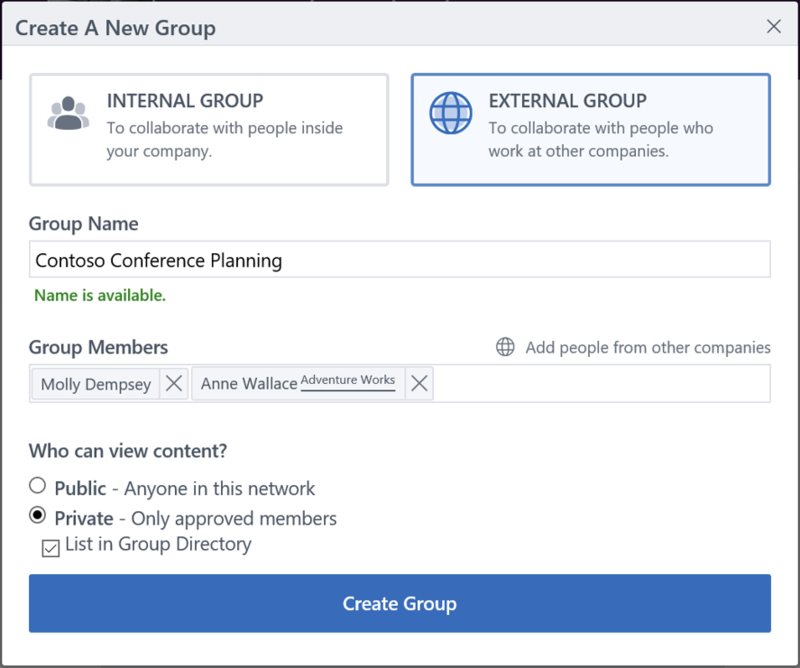 Visit “Create and manage external groups in Yammer” to get started. 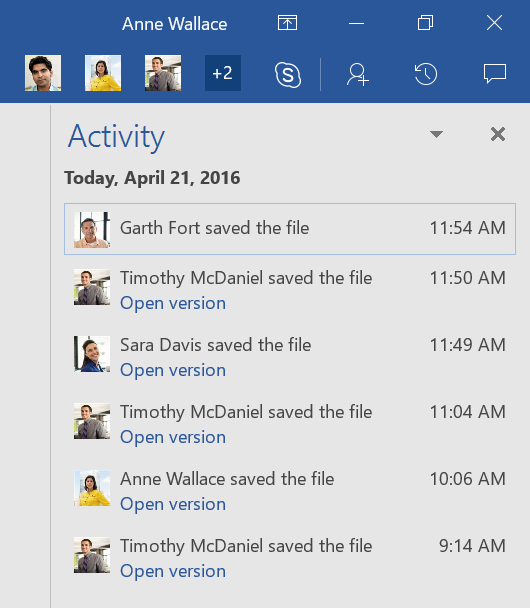 Now you can create external Yammer groups for extended team collaboration. 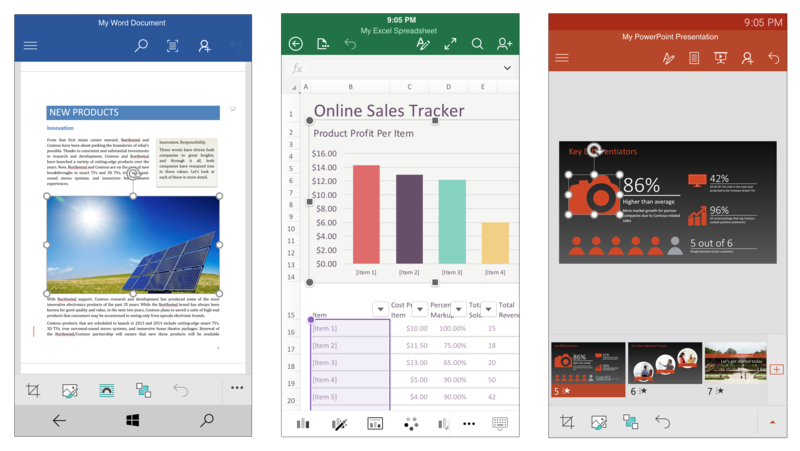 Edit with speed—New mobile updates provide access to the most popular commands right at your fingertips in Word, Excel and PowerPoint for Windows Phone, iPhone and Android. These commands appear at the bottom of the screen, tailored for the content you select. Quickly access relevant features based on content you select in Word, Excel and PowerPoint on phones. 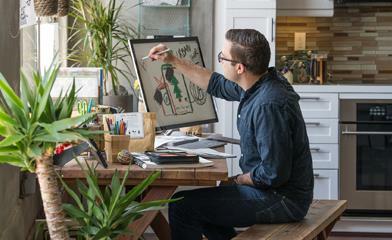 Record audio into OneNote on Windows Phone—It’s easy to capture a quick audio note on the go with your Windows Phone. Simply tap the paper clip and then the microphone on your keyboard command bar to get started. Get insights at a glance—We expanded Smart Lookup to Word, Excel and PowerPoint for Windows tablets and phones. Smart Lookup is powered by Bing and uses the selected text and surrounding content to give you contextually relevant results. Right click on text and select Smart Lookup to get started. 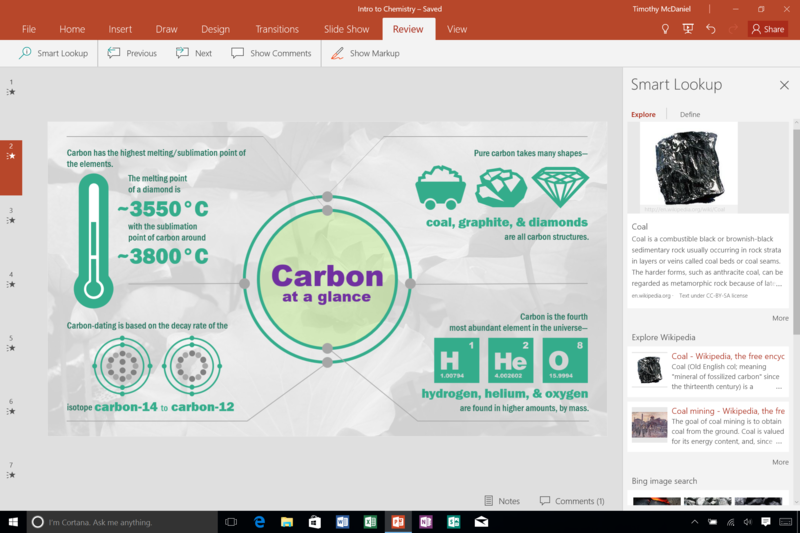 Get insights at a glance with Smart Lookup in Office Mobile apps. Learn more about what’s new for Office 365 subscribers this month at: Office 2016 | Office for Mac | Office Mobile for Windows | Office for iPhone and iPad | Office on Android. If you’re an Office 365 Home or Personal customer, be sure to sign up for Office Insider to be the first to use the latest and greatest in Office productivity. Commercial customers on both Current Channel and Deferred Channel can also get early access to a fully supported build through First Release. Thanks for your continued feedback and support!